Calcutta (Kali Ghatta, the ghaut or landing place of the goddess Kali, wife of Siva), a city of Hindostan, capital of the province of Bengal, metropolis of British India, and seat of the supreme government of that country, situated 100 m. from the sea, on the E. bank of the Hoogly river, the W. branch of the Ganges, its citadel being in lat. 22° 34' 49" N., Ion. 88° 27' 16" E. In 1866 the population of the city proper was 377,924, of whom 239,190 were Hindoos, 113,059 Mohammedans, 11,224 Europeans, 11,036 Eurasians (progeny of a European father and a native mother), and 681 Jews; the population of the suburbs was 238,-325; total of city and suburbs, 616,249. The population of the city in 1872 was 447,601. - On ascending the Hoogly, the scenery, which for many miles from the sea is dreary and uninviting, becomes more picturesque as one approaches Calcutta. No land is visible at the mouth of the river, the channel of which is marked out by lighthouses and buoys, and must be followed many miles inland before the low lands of the Sunderbunds can be detected. Nearing the city, which extends about 6 m. along the river and has an average breadth of about 2 m., the botanical gardens are perceived on the W. bank, stocked with many varieties of indigenous and exotic plants, and the Bishop's college, a handsome Gothic edifice erected under the auspices of the society for the propagation of the gospel in foreign parts. The beautiful suburb known as Garden Reach, opposite the river anchorage, occupies the E. shore, with country seats surrounded by elegant gardens! Here stands the vast palace of the dethroned king of Oude, where he resides as a pensioned prisoner of state, receiving from the British authorities an annual income of £120,000. Its architecture is gorgeous and much admired. North of this is the Maidan or plain, a level open space not quite 2 m. long, 1 1/2 m. wide at its southern, and about £ m. at its northern extremity. In the Maidan, nearly equidistant between these boundaries, and not far from the river, is Fort William, the citadel of Calcutta. The works are low and octagonal in outline, three sides facing the Hoogly. The fortress mounts 619 guns. A garrison of 10,-000 troops would be requisite to defend it, and even 15,000 can be accommodated within the walls. Its heaviest batteries are on the river front. That portion of the Maidan lying between the fort and the main body of the city is known as the Esplanade. 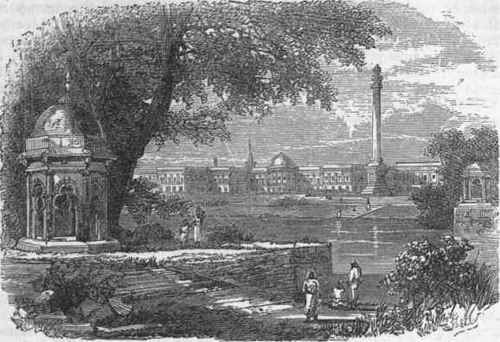 Beyond the Maidan to the northward rises the "city of palaces," as Calcutta has frequently been called; and viewed from the river the appearance of the city is so magnificent as to justify the appellation. A closer examination, however, casts a doubt upon its correctness. Opposite the town, the river varies in width from a quarter to three fourths of a mile, and affords anchorage for ships of 1,500 tons burden, in six or seven fathoms of water. Owing to the hurricanes which sometimes prevail, the roadstead is not a very safe one; and it is usual to moor vessels to the shore, as a precautionary measure. The water front is bordered by a quay 2 m. long, called the Strand, at a level of 40 ft. above low-water mark, with ghauts or landing places at intervals along it. - Calcutta is situated on level land, and is divided into a northern or native and a southern or European district. In the quarter inhabited by the native population the streets are narrow and unpaved, with lofty houses loopholed in the upper stories, and occupied as shops or stores on the ground floor. There is much poverty and filth in many localities. The section of the city chiefly inhabited by Europeans is called Chowringee. The European houses are built of brick covered with stucco, are generally detached from one another, and have spacious verandas. There are several extensive squares in this quarter, each of which encloses a tank near the middle, with a planted walk surrounding it. A street 60 ft. in width intersects the city parallel to its greatest length. The Strand extends southward along the river border of the Maidan, here forming the favorite pleasure drive of the European residents and wealthy natives. The northern portion of the Esplanade contains the government buildings, fronting a park called the Eden gardens. Of these, the viceroy's palace, known as the government house, is the finest edifica in Calcutta. It stands in a conspicuous locality, is of massive proportions, and consists of a spacious central structure surrounded with four great wings and surmounted by a magnificent dome. The other government offices, the town hall and the post office, which is built on the site of the memorable black hole, are also in the Esplanade, which is ornamented with an equestrian statue of Lord Ilardinge. The monument of David Ochterlony, near the N. E. corner of the Maidan, is a lofty tower, commanding a view of the city and all the surrounding country. For the most part, the residences of the foreign merchants and officials are E. of the Maidan, the eastern boundary of which is the Chowringee road. Many of these dwellings are palatial, some of the most elegant being in a range on a line with the government house called Esplanade row. In addition to those already mentioned, the principal buildings comprise the new Anglican cathedral, the mint, the numerous Christian churches, Protestant, Roman Catholic, and one Greek and one Armenian, the Jewish synagogue, the Mohammedan mosques, and the Hindoo temples. The Sikhs have a place of worship, as also have the Chinese. There are many educational institutions, secular and religious, the university of Calcutta being the most important of the former. It was originally the college of Fort William, and was designed for the instruction of candidates for the civil service of the East India company; its purposes are now more general, although its functions are limited to holding examinations and granting degrees. More than 800 students matriculated in 1867. Its lowest degree is believed to indicate acquirements equal to those of the graduate of a European university. The Madrussa or Mohammedan college, the Hindoo college, the Sanskrit college, and the Anglo-Indian college are establishments also under government control. The Martiniere is an institution for the education of the poor of both sexes, founded under the will of Gen. Claude Martin, who amassed great wealth in the East. The Bishop's college, established in 1819 by Bishop Middleton, trains students in the doctrines of the church of England, for missionary work in India. Colleges are also supported by the established church, the Free church of Scotland, and the Jesuits. There are numerous hospitals, a public library, a theatre, and many literary and scientific institutions; among the latter the Asiatic society, formed in 1784, through the efforts of Sir William Jones, stands preeminent. The medical college is distinguished for the ability and learning of its faculty. - Calcutta is supplied with water by means of tanks constructed to collect the periodical rains. All endeavors to procure water by boring have hitherto failed; the soil seems peculiarly deficient in springs, even though it has been pierced to a depth of 500 ft. The tanks, of which the city contains more than 1,000, are of masonry, and preserve the water in excellent condition. It is distributed by carriers, who convey it about in leathern bags. The climate, formerly considered exceedingly dangerous to foreigners, has been somewhat ameliorated by the adoption of proper sanitary measures; but of its extreme unhealthi-ness during the hot season there can be no question. When summer sets in, every official who can do so leaves Calcutta. The average annual rainfall is about 64 inches. The rainy season lasts from June to October. The temperature ranges from a monthly average of 66° F. in December and January to one of 85° in April and May, 83° in June, and a maximum of 100° to 110° in the open air in the last named month. Vultures, kites, crows, and the adjutant stork by day, and foxes, jackals, and wild dogs by night, act as public scavengers, and perform a most important office, which doubtless essentially contributes to the health of the city. - The British merchants form the most influential and wealthiest class, and are noted for their hospitality. The Armenians are largely engaged in commerce with various parts of the East, and the retail trade is almost monopolized by the natives. The shops or bazaars are furnished with a plainness which must strike a stranger forcibly, but every kind of goods of every quality can be purchased as readily as in England. An industrious and serviceable class are the Eurasians, who are employed to a considerable extent in mercantile houses and as government clerks. The brokers, denominated sircars and baboos, are exclusively Hindoos. The foreign trade of Calcutta is. mainly in the hands of English merchants. The commerce of nearly all the interior of Bengal, and of a very large proportion of India, centres here. The chief exports are opium, cotton, rice, indigo, jute, seeds, silk, hides, saltpetre, sugar, and lac; the principal imports comprise cotton twist and yarn and piece goods, metals, railway materials, machinery, wines and spirits, salt, woollen goods, malt liquor, wearing apparel, and books and stationery. In the year ending March 31, 1872, the imports into Bengal represented a value of £19,741,420, and the exports £27,849,-329.'. By far the largest portion of this trade goes through Calcutta. In the year 1869-'70 923 vessels entered the port, and there were 936 clearances. - Calcutta is connected by railway and telegraph with Bombay, and with the large cities of northern and central India, and by regular steamship lines with Europe and all the great countries of the East. The Anglican see of Calcutta was established in 1814, and the bishop is the primate of India. A high court of general appellate jurisdiction holds its terms at Calcutta. The city is a favorite field for missionary enterprises, and missionaries of all denominations are to be found there. A number of newspapers and magazines are regularly published in English, and several in the different native languages. - The site of Calcutta was originally occupied by the village of Govindpore. In 1698 the English factories at Hoogly were removed thither by the East India company. In 1700 three small villages near the factories, one of which bore the name of Calcutta, were assigned to the British by the native rulers. One of these villages occupied the site of the present European quarter, another stood where the native residences are now erected, and the third has given place to the beautiful plain on the S. side of the citv, in the midst of which stands the citadel. In 1756 the settlement, which then contained only 70 houses occupied by Euro.-peans, was captured by Surajah Dowlah, the subahdar of Bengal. (See Black Hole.) The British forces under Clive regained supremacy and recovered the town early in the following year. The construction of Fort William, the most extensive and elaborate regular fortress in India, was begun in 1757, after the battle of Plassey; and in 1758 Meer Jaffeer, the successor of Surajah Dowlah as native viceroy, remitted the rent which the East India company had previously paid for the tenure of the city. The subsequent career of Calcutta has been peaceful and prosperous. Government Buildings and Ochterlony Monument.